If you read my post last week, you know it hasn't been a particularly easy time for me. But I've been doing ok, at least after the initial shock. One way to get my mind off things is to go out on a bike ride. I liked that idea so much, I took two. The first one happened last Saturday, July 27. My friend Brad organized what he called the "Totally Generic Century", a 102 mile loop around Portland. Nine of us met up in inner SE at 8(ish) to test the route. 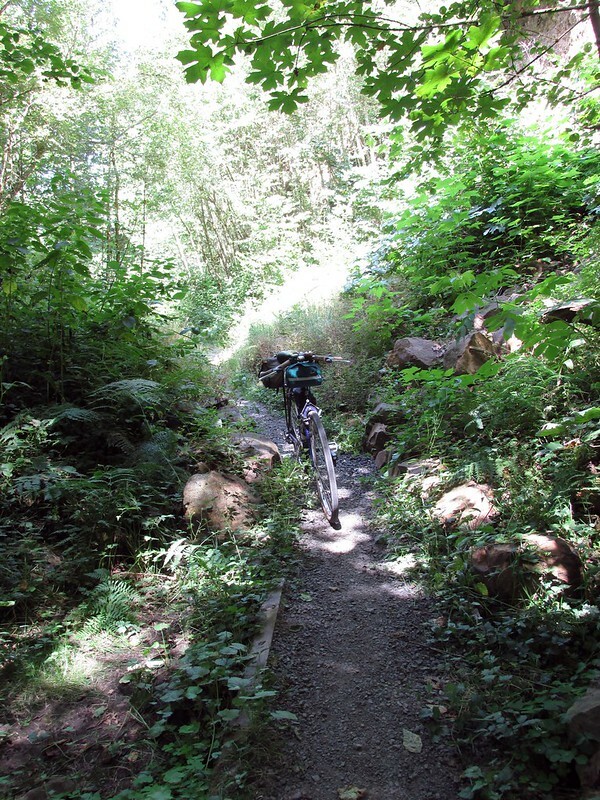 The first quarter traversed familiar lands and used the Springwater Corridor trail to get out to rural Clackamas County. Then it was 25 miles over some serious rolling terrain on quiet country roads with great scenery and views. 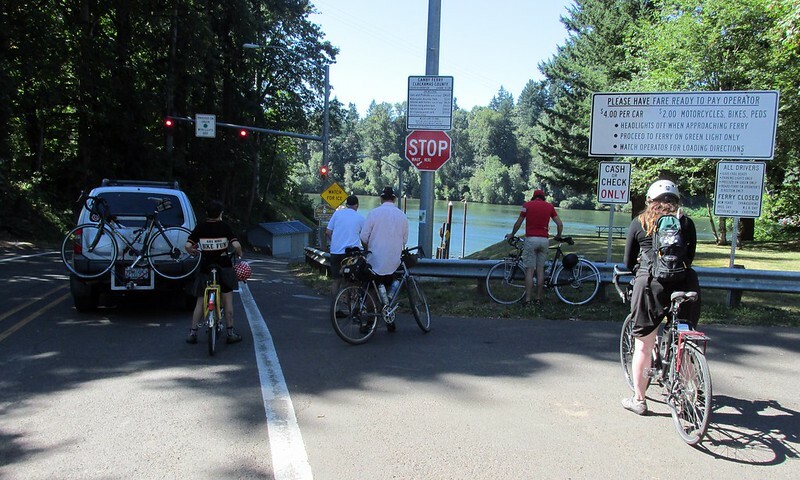 We broke for lunch in Canby and then crossed the Willamette by the Canby Ferry. There are three vehicle ferries on the Willamette between Eugene and Portland, yet up until now I never crossed any of them! Check that off the list. It was about 10 miles later until we got to our major hurdle: on the outskirts of Wilsonville the road we intended to use did not exist anymore! Rather than attempt to detour to get back onto our route, we opted to shorten things up and head back to Portland. (It was getting late, we were tired, and it was a warm day.) Our 100 mile day turned into an 80 mile one instead. Hey, it's still more than a metric century, right? This time I took Leif Erickson all the way to Springville Road, a distance of about 10 miles. This is the longest stretch of the road I've done in years, as my previous adventures had ended at Saltzman. From Springville I crossed too busy St. Johns Bridge into North Portland. 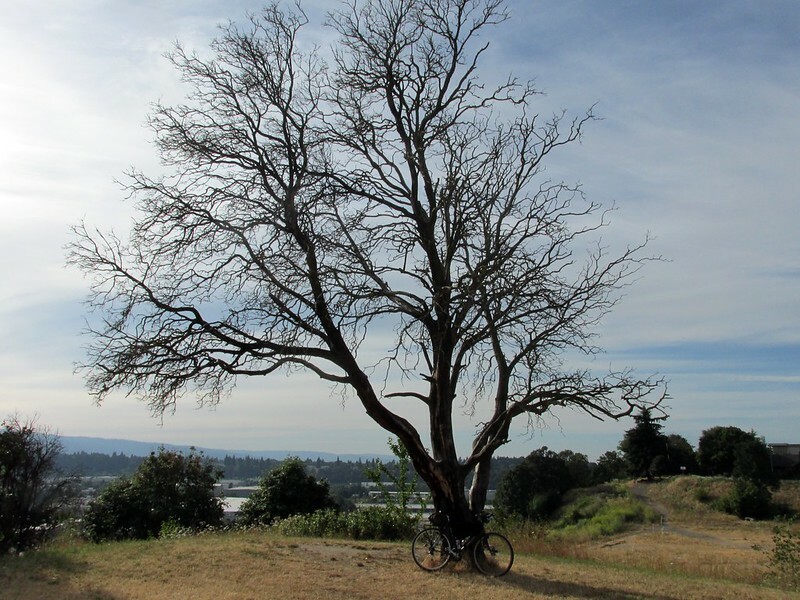 From there I meandered along the bluffs above the Willamette, passing by some of my favorite spots in Portland like the fabled Dead Madrona Tree of Rivendell Ridge. Oh yeah, eagle-eyed readers may notice a few changes to the XO-3, changes that I haven't had time (or have been too distracted) to mention. I swapped the generic drops with Nitto Mustache bars (and Nitto Dirt Drop stem) provided courtesy of Big Dummy Daddy. (Thanks, Andy!) And the clamp-on Sun Tour downtube shifters? Gone, replaced with Shimano bar-ends. All done up with some cloth tape, twine, and shellac. Much more Bridgestonesque/Rivendellesque/Petersenesque. (I know, I know, the 1992 XO-3 didn't come with mustache bars, but whatever.) Also to note is the green Carradice Lowsaddle Longflap that I got from Nick of Gypsy By Trade. One other thing to note about the tires and wheels: Unlike my other primary bikes, the XO-3 is fenderless. * I did have some Planet Bike Fenders on for one hot second when the 700x35C Panaracer Pasela Tourguard tires were on it. Then I got the fatter Resist Nomads** and there just wasn't enough clearance, so the fenders went. 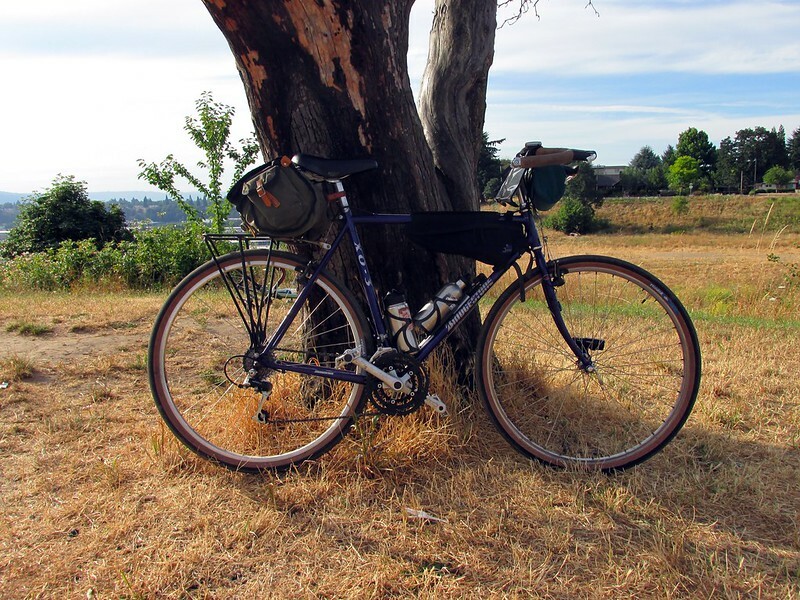 Thankfully it's summer in Portland so I don't have to worry about rain, but when the rains return I'll have to decide whether to install janky clip-on fenders, go for a smaller tire, or abandon the bike until drier weather returns. Any thoughts, people? *Or, if you are like that, mudguardless. **Though the Resist Nomads are billed as 45 mm wide tires, folks who have physically measured them said they are more like 41 mm wide. Nothing like continuing to ride to clear the head. I hear you. I love the mustache bars. It's very appropriate for this bike. As for fenders, maybe this will only be a summer bike? I'm struggling with the same thing here on my Peugeot, I have a bit wider tire for comfort and I'm not sure whether I'll have space for fenders...or do I really want them? The bars and stem look much better on your XO-3 than any bike I ever tried them on. Oh, and shellac? Fancy! Glad it worked out. My vote would be to keep the fatter tires and choose another bike for wet conditions. I tend to gravitate to fat if possible. However, the precipitation factor of your area is much different than mine. Bike therapy is good therapy. Cheap, too. If you want to ride the XO-3 lots I'd put on 35mm tires with fenders for the rainy season, and switch back to fatter n' fenderless next summer. A bit of PITA but offers a bit of both worlds. I have 700x35 on my Kona Jake cross bike and I've comfortably ridden some pretty rough terrain with it. I find precious little time to browse other people's bikes on the internet, as I am busy eating pyrohy and drinking vodka and piwo. I came here, to discover the Bridgestone is looking quite fine. Fenderless with Resist Nomads is a good way top be in the summer. The chance of a little splash on the bottom isn't so bad, compared to a ligthweight, noiseless steed. I love the rough stuff rides you have been hunting around the city. Thanks for stopping by, Nicholas!